The ICHLC is delighted to announce the programme for a significant conference to be held in NUI Galway / Galway city centre, on Friday and Saturday 11-12 November 2016. The conference will commence on Friday at 1.45 pm, with a welcoming address from Dr Sarah-Anne Buckley. There will be a registration charge of €5 (a contribution to cost of tea, coffee, etc). The ‘One Big Union’ was a motto of the Industrial Workers of the World (IWW), founded in Chicago in 1905. Reflecting disappointment with the achievements of political Labour, the IWW was ‘syndicalist’ in advocating that working people rely on militant trade unionism (and not politics) to create a fair society. Prominently associated with the IWW’s revolutionary ‘Wobbly’ wing were Cork-born Mother Jones, Tom Glynn of Gurteen, Co. Galway, and James Connolly, an IWW organiser in New York. ‘Big Jim’ Larkin gave a graveside oration for Joe Hill, best-known of the Wobbly martyrs. bodies like the Irish Transport & General Workers’ Union and the Irish Citizen Army. a post by James T. O’Donnell. 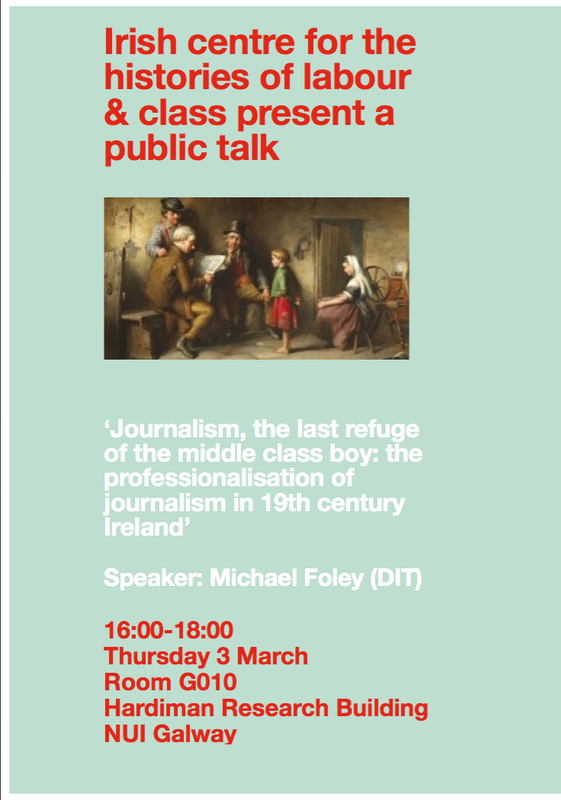 Historically mainstream Irish newspapers are often viewed in terms of their perceived political and confessional identities. These perceptions are not inaccurate and are justified by their published content. The commercial and structural organisations behind the headlines are less often considered. Through an examination of records from the Press Association’s (PA) Annual General Meetings (AGM) this short piece will reveal how the senior executives and owners of Irish newspapers had much in common with each other and, indeed, with their British counterparts. This, it will be argued, indicates the existence of a class identity that largely ignored national and political identities. At the PA’s 1916 AGM, held shortly after the Easter Rising, the chair’s statement noted ‘considerable regret in the absence of our members from Dublin – from the Capital City of our Sister-Isle – more especially as we know the reason why they are not with us’. 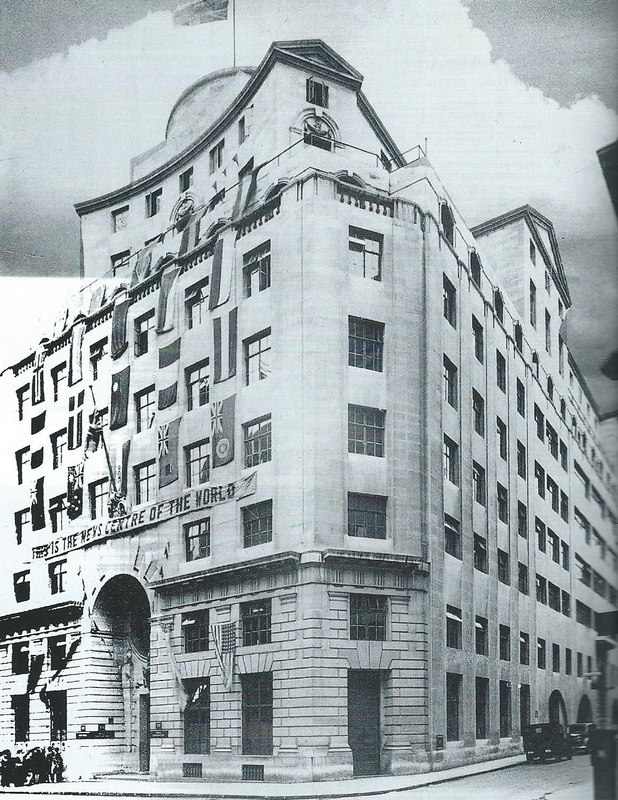 The PA was a news agency established along cooperative lines in 1869 by the non-London-based newspapers of Britain and Ireland to gather and disseminate national and international news. Irish newspapers, along with their British counterparts, had been actively engaged in its formation and were regularly represented at general meetings. In 1916 George Crosbie of the nationalist Cork Examiner was a member of the board. The chair’s statement continued by noting that when ‘the history of Easter Week is recorded we shall realise more fully than we do to-day the circumstances with which they have had to contend, and the dangers through which they have passed’. The Dublin newspapers were indeed disrupted by the events of Easter Week. No title managed to publish continuously throughout the week; the Irish Times’ storage depot was destroyed, the offices of the Irish Independent and those of the Dublin Daily Mail and Dublin Evening Express were seized by members of the Volunteers and the Irish Citizen Army respectively, and the Freeman’s Journal’s premises were destroyed with the loss of its printing equipment and records. In the aftermath of the Rising and following lobbying from the Irish newspapers’ managements the PA paid compensation to the Dublin newspapers of sixty percent for seventeen days of disruption to services. In addition it paid the same compensation for fourteen days for Cork and six days for Belfast and Derry, indicating a level of disruption to titles outside Dublin that has yet to be fully examined. Upon his nomination to the board being endorsed by the AGM Henderson stated in his acceptance speech that: ‘I am a member for both the Nationalist and Unionist Party in Ireland. I have had meetings in Dublin at which Nationalists and Unionist were present, and I think they were always very successful meetings’. The comparison here to James Larkin’s comment in relation to the 1913 Lockout in his presidential address to the Irish Trade Union Congress in 1914 is striking: ‘there was neither Unionist nor Nationalist among the employing class; and but two camps – employers and workers. We found no Redmondites, Carsonites or O’Brienites then. The enemy were all employers’. William Martin Murphy, proprietor of the Irish Independent among other business interests, had played a key role in the Employers Federation when the decision was taken to lockout members of the Irish Transport and General Workers Union in 1913. An interesting addendum to these events occurred 1935. At the AGM that year James Henderson of the Belfast Newsletter was elected to the PA’s board. His proposal was seconded by George Crosbie of the Cork Examiner. Though not as striking as the proposal by Brewster of Charles Henderson in 1917 the speech in support of Henderson’s nephew by Crosbie, whose father had served on the PA board 1907-17, did contain a taste of the 1917 vintage. Whilst recommending Henderson for his celerity and hard work Crosbie commented that: ‘Perhaps it may seem funny to you that I, as a Cork man should be supporting the election of a Belfast man, but that sort of thing does happen sometimes (laughter)’. The high regard and cooperative business attitude of the previous generation of Irish newspapers owners seems to have survived the turmoil of the intervening years well enough to stretch across the border and generations of the two youthful polities. What has briefly been highlighted here is the existence of attitudes within the managerial and executive ranks of Irish newspapers that paid little attention to the published political affiliation of their titles. Where these political differences were mentioned it was to minimise their significance and to highlight their shared commercial interests and personal relationships. This can be seen to confirm Larkin’s statement in 1914 to a significant extent. The actions and opinions that they demonstrated could be suggested to represent evidence of commercial class identity: ‘Historical capitalism […] is not a mode of production at all. It is a social formation’. If the basis of class is a shared value system then the basic principles of a class identity among this group can be seen here, and one that operated outside the traditional analysis of national, political and confessional boundaries in Irish newspapers. ‘Minutes of PA AGM, 1916’, Guildhall Library Manuscripts Collection, London (GL), MS 35365/9. Mark O’Brien, The Irish Times: A History (Dublin: Four Courts Press, 2008), p. 48; Hugh Oram, The Newspaper Book: A History of Newspapers in Ireland, 1649-1983 (Dublin: MO Books, 1983), pp. 127-9. ‘PA Committee of Management / Board of Directors Minute Book, November 1917’, GL MS 35358/19. ‘Report of PA AGM, 1917’, GL MS 35365/9. Jim Larkin, ‘Each for All and All for Each’ in Donal Nevin (ed.) James Larkin: Lion of the Fold (Dublin: Gill and Macmillan, 2006), p. 268. Alvin Jackson, Ireland 1798-1998: War, Peace and Beyond, 2nd edn. (Chichester: Wiley-Blackwell, 2010), pp. 190-1. ‘Report of PA AGM, 1935’, GL MS 35365/13. Henk Overbeek, ‘Transnational class formation and concepts of control: towards a genealogy of the Amsterdam Project in international political economy’, Journal of International Relations and Development, Vol. 7 (2004), p.121. 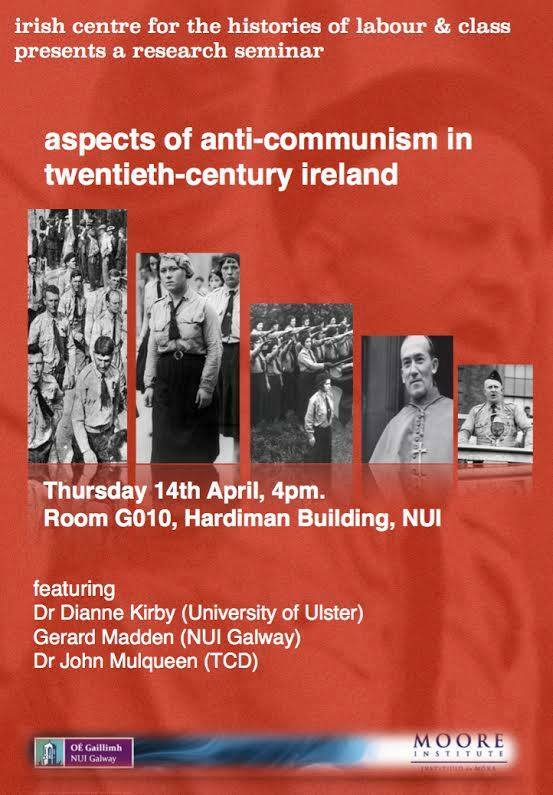 The ICHLC Seminar Series continues this Thursday with a Seminar entitled ‘Aspects of anti-communism in twentieth century Ireland’. Time and date: 16:00, Thursday, 14 April. Please note that Gerard Watts’ ICHLC seminar on ‘James Larkin Letters: 31 December – 2 June 1922’ originally organised for this Thursday 24 March has been rescheduled. The new time and venue are 16:00 on 21 April, room GO10 Hardiman Research Building, NUIG. The other upcoming seminars remain the same. 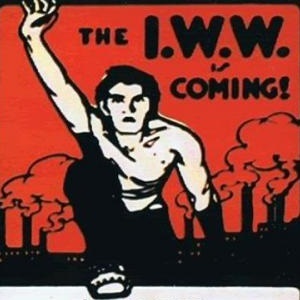 The Industrial Workers of the World (IWW), also known as the ‘Wobblies’, was founded in Chicago in 1905 as a union dedicated to organising all workers, regardless of skill, craft, ethnicity or gender, into ‘One Big Union’, to improve immediate conditions and struggle for the revolutionary overthrow of capitalism. It became known for its success in organising unskilled workers in industries such as mining, agriculture, textiles and the docks, and was notorious for its rank-and-file militancy and subsequent repression by the state. Moving from its origins in the United States, it also organised in Canada, South Africa and Australia, and has been immortalised for its agitational artwork and folk songs such as ‘Joe Hill’. From the beginning, it attracted workers and radicals amongst the Irish diaspora such as James Connolly, James Larkin, Mother Jones (Mary Harris) and Elizabeth Gurley Flynn. Two Irish members of the IWW, Peter Larkin and Tom Glynn, were amongst the infamous ‘Sydney Twelve’ arrested and charged with treason in Australia in 1916. Its ideas and organisational model also impacted upon the labour movement in Ireland, particularly in the Irish Transport and General Workers’ Union. This conference has been organised to explore some of these connections, and to look at the legacy of the IWW in Ireland and amongst the Irish diaspora. Biographical studies of the Irish in the IWW – in the US, Canada, Australia, South Africa, etc. The afterlives of Irish activists in the IWW – communists, anarchists, republicans, etc. by 22 April 2016 at the latest.